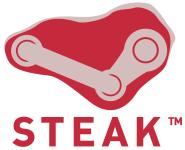 You’re probably all aware of Valve’s recent “Steam and the PC platform in general” press conference. Steamcloud is the headline announcement of course, but our old friend John Cook also listed a few other upcoming developments. IGN interviewed Doug Lombardi at a recent EA press event, and are now reporting Valve’s interest in making a gamepad peripheral. England continues to be the epicentre of Steam discussion with the new blog Steam Report, launched last month by John Griffin and Andy Griffiths. There’s a double-act joke in there somewhere. Valve have just launched their Steamworks partner website, and wonderfully, it’s partially open the public.